This ashtray is the slightly more regal styling of the classic Stinky Ashtray. Comprised of 4 stirrups, a deep bowl that will hold a great day's worth of cigar ash, and an elegant brushed gold finish. 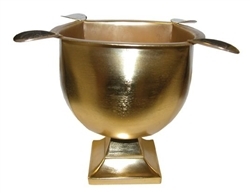 The Stinky Ashtray design is wind-proof and this deep bowl makes it even more resistant. If your last name is Lannister, you should probably ash your cigar in this particular Stinky Ashtray.